Like many people, I first looked to Chiropractic for pain relief. At age fifteen, I injured my neck while playing high school football and suffered with chronic pain for the next three years. During that time, none of the specialists I consulted for my injury were able to help. The cause of my pain was not identified and it wasn’t going away either. Pain made it difficult to focus in my high school classes and I wondered if I would spend the rest of my life in pain. It wasn’t until I met a NUCCA chiropractor that the cause of my problem was addressed. 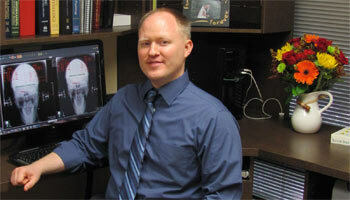 I have already recommended Dr. Jason to friends because I am very impressed with what he does. My mother heard from a friend of a chiropractor who used a specialized technique. I traveled from New York to Calgary, Alberta where I was able to start with NUCCA care which greatly changed my life! The doctor explained what the cause of my problem was and that he would correct it with specific adjustments to the neck. The procedure was extremely gentle and I was excited to have found a solution for the cause of my pain! After a short time, I was free of pain and was able to return to a normal, active life. I’m the chiropractor in Houston that learned how NUCCA is not only effective for symptoms, but how it allows the nervous system to function properly to maintain whole body health. Therefore, I have continued with chiropractic care for 19 years and cannot imagine my life without it. After receiving the benefits of this specific form of chiropractic I developed a great desire to share it with others. Therefore, I studied this specialized technique at the prestigious Palmer College of Chiropractic to become a NUCCA specialist and have been active in NUCCA ever since. Houston Spinal Care is the only NUCCA practice in Houston, Texas. I look forward to helping you and your families obtain optimum health ! Contact us today to get started with care!